Recommended citation: Ohkura N, Atsumi G, Uehara S, Ohta M, Taniguchi M. Ashitaba (Angelica keiskei) Exerts Possible Beneficial Effects on Metabolic Syndrome. OBM Integrative and Complementary Medicine 2019;4(1):12; doi:10.21926/obm.icm.1901005. Metabolic syndrome is a serious health condition comprising a combination of glucose metabolism disorder, high blood pressure and obesity. The main underlying risk factors for metabolic syndrome are abdominal obesity and insulin resistance. Various studies have shown that herbal medicines can effectively reduce the risk of developing metabolic syndrome. Angelica keiskei Koidzumi (ashitaba), a large perennial herb native to the Southeast Pacific coast of Japan, has recently become a popular herbal medicine, dietary supplement and health food in Asian countries. Ashitaba leaves, stems and roots contain abundant nutrients and dietary fiber, as well as various natural substances such as chalcones, flavanones and coumarins. Various physiological and biological activities of ashitaba and its natural derivatives have recently been demonstrated in numerous studies. The accumulated evidence emphasizes ashitaba health benefits and supports its most common use against metabolic syndrome. Here, we summarize current information derived from studies on the effects of ashitaba on various pathological disorders associated with metabolic syndrome. Metabolic syndrome (MetS) is a serious health condition involving a combination of glucose metabolism disorder, high blood pressure and obesity. For MetS sufferers the risks of developing type 2 diabetes (diabetes mellitus), stroke, myocardial infarction (MI) and death are five-fold, two- to four-fold, three- to four-fold and two-fold higher, respectively, than for those without MetS . Because the main underlying risk factors for MetS are abdominal obesity and insulin resistance, proper MetS management requires control of both body weight and insulin resistance. Meanwhile, individualized treatments for hyperglycemia, hypertension and hyperlipidemia are concurrently administered to prevent serious MetS-triggered pathological disorders according to the unique needs of each patient. Since various studies have shown that herbal medicines can decrease body weight, blood glucose, lipids and blood pressure, such medicines might serve as alternatives to current pharmaceuticals for treating metabolic diseases [2,3,4,5]. One advantage of herbal medicines is that they have been used to treat human diseases for many years; thus, much is known about their effects in vivo and overall safety. This review presents evidence derived from published studies of the effects of ashitaba on various pathological disorders related to MetS. Ashitaba is a large perennial herb of the Apiaceae family, genus Angelica (Shiidida) that is native to the Southeast Pacific coast of Japan (Izu Islands and the Izu, Bōso and Miura peninsulas; Figure 1A). Ashitaba is the common Japanese name for the Angelica keiskei cultivar Koidzumi. The name of the botanical species Angelica is derived from the Latin word for angel and the word keiskei is derived from the name of Keisuke Ito, the 19th century Japanese botanist recognized as the father of modern Japanese botany. The English translation of the Japanese word “ashitaba” is “tomorrow's leaf," a phrase that reflects the plant’s vitality, likely due to the ability of the plant to quickly regenerate itself within a day of cutting . Ashitaba has been consumed as both a vegetable and folk medicine by inhabitants of the Izu islands since ancient times and it is currently used in cooking, including stir-fry, tempura, tea, soba and ice cream dishes. With the recent upsurge in health-consciousness, ashitaba has become a popular health food and dietary supplement and is now also cultivated and consumed in Korea, China, Indonesia and Taiwan [6,7,8]. Figure 1 Flowering Angelica keiskei Koidzumi (ashitaba) and ashitaba exudate Flowering ashitaba (A) and yellow exudate from ashitaba stem (B). Ashitaba leaves, stems and roots contain abundant nutrients, such as vitamin A, vitamin K and dietary fiber, as well as chalcones, flavanones and coumarins . Many investigators have recently discovered various physiological and biological activities of isolated and structurally characterized ashitaba chalcones, flavanones and coumarins [7,8]. Figure 2 Structure of chalcones from Angelica keiskei. The ends of cut ashitaba stems exude large amounts of a yellow liquid containing abundant chalcones (Figure 1B) that after drying comprise 8% (w/w) of the total plant dry weight . Various ashitaba chalcones in leaves, stems and roots have been isolated and structurally analyzed [10,11], resulting in the identification of at least 20 chalcones [6,7,8]. The two major ashitaba chalcones, 4-hydroxyderricin (4-HD) and xanthoangelol (XA), exist in almost equal proportions and account for >90% of the total chalcone content of ashitaba plants. The physiological activities of ashitaba have mainly been investigated using the two most abundant chalcones, 4-HD and XA. 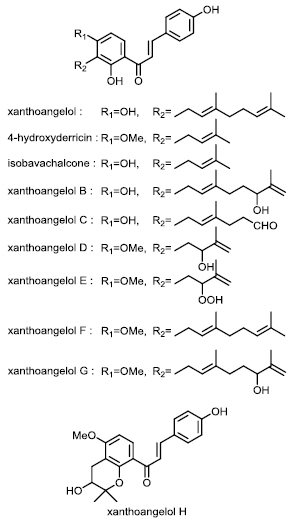 However, trace amounts of xanthoangelols B, C, D, E, F, G, H, isobavachalcone and several other chalcones [6,7,8] are also known, but their activities have not yet been investigated (Figure 2). Initial studies of the physiological activities of ashitaba initially proceeded based on folklore originating from the Izu Islands. Early findings indicated that XA from ashitaba might possess antitumor activity, suppress gastric acid secretion and possess antimicrobial activities [12,13,14]. Thereafter, various physiological activities of the major chalcones 4-HD and XA were identified by investigators in Japan and other Asian countries [15,16,17,18,19]. After demonstrating that ashitaba might suppress high blood glucose and exert anti-obesity effects , the herb gained attention as a health food and supplement to treat lifestyle-associated diseases such as obesity, diabetes and MetS. Although much attention has been directed towards the major chalcones XA and 4-HD, potential beneficial effects of ashitaba trace compounds on MetS remain unknown and warrant further investigation. Hyperglycemia results from impaired carbohydrate metabolism and increased insulin resistance and is among the defining features of MetS . Polyphenol-rich foods, such as tea, cocoa, cinnamon and grapes, modulate carbohydrate metabolism and attenuate hyperglycemia as well as insulin resistance [22,23]. Meanwhile, numerous studies of the hypoglycemic effects of ashitaba have proceeded since an important study by Enoki et al. found that ashitaba 4-HD and XA exhibited powerful insulin-like activities in cultured 3T3-L1 cells and prevented hyperglycemia when each chalcone was orally administered to KKAy type II diabetic mice; blood glucose levels were reduced by 50% and 33%, respectively, compared with controls . Moreover, their results showed that cultured 3T3-L1 cells differentiated into adipocytes in the presence of 4-HD or XA (but not insulin) via a pathway that is independent of peroxisome proliferator-activated receptor-gamma (PPAR) activation. This was the first study to generate powerful evidence supporting the ability of ashitaba to decrease blood glucose levels . Skeletal muscle cells uptake glucose mainly to maintain blood-sugar homeostasis, but obesity can impair glucose uptake and lead to hyperglycemia . Glucose translocation is predominantly completed by glucose transporter 4 (GLUT4), the activity of which is regulated by protein kinase ζ/λ (PKC ζ/λ), protein kinase B (Akt) and adenosine monophosphate-activated protein kinase (AMPK). Kawabata et al. demonstrated that 4-HD and XA stimulate glucose uptake by L6 rat skeletal muscle cells through the induction of GLUT4 translocation . Each of 4-HD and XA at a concentration of 10 µM induced glucose uptake into L6 cells at the same rate as insulin at 0.1 μM. At 30 µM, 4-HD and XA increased glucose incorporation into L6 myotubes 2.8- and 1.9-fold, respectively, compared with non-stimulated cells. Notably, 4-HD and XA did not activate proteins typically activated by insulin-induced GLUT4 activity, such as PKC ζ/λ, Akt and AMPK , suggesting that 4-HD and XA interact with other signaling components within the insulin-induced GLUT4 activation cascade. Ohta et al. showed that 4-HD and XA induced both GLUT4 translocation to the plasma membrane and glucose uptake by 3T3-L1 adipocytes, and that 10 µM 4-HD or XA stimulated glucose uptake into L6 myotubes 1.47- or 1.48-fold, respectively, compared with unstimulated cells. Mechanistically, both 4-HD and XA stimulated the phosphorylation of AMPK and its downstream target acetyl-CoA carboxylase and increased the phosphorylation of liver kinase B1 (LKB1), which acts upstream of AMPK. Furthermore, using small interfering RNA knockdown of LKB1 expression, attenuated 4-HD and XA both stimulated AMPK phosphorylation and reduced glucose uptake, with 4-HD- and XA-induced GLUT4-dependent glucose uptake occurring via the LKB1/AMPK signalling pathway in 3T3-L1 adipocytes (Figure 3). Figure 3 Proposed mechanism of effects of 4-HD and XA on GLUT4-dependent glucose uptake in 3T3-L1 adipocyte . An important enzyme in carbohydrate metabolism, α-glucosidase is located within the brush border of the small intestine, where it breaks down carbohydrate to glucose. Because α-glucosidase inhibition lowers the glucose absorption rate by slowing carbohydrate digestion, α-glucosidase is an attractive target enzyme for suppressing the onset of hyperglycemia. To test this concept, Luo et al. showed that XA and other compounds could inhibit-glucosidase at IC50 values of ≤20 µM for substrate 4-nitrophenyl-α-D-glucopyranoside, which were considerably lower than that of the control drug acarbose (IC50 = 384 µM) . Oral glucose tolerance tests (OGTT) showed that the oral administration of chalcone-enriched ashitaba extract containing 150.6 mg/g (dry base) of 4-HD and 146.0 mg/g (dry base) of XA suppressed acute hyperglycemia in mice in vivo . Ethanol extracts of ashitaba notably improved insulin resistance and hypertriglyceridemia in a rat model . Ethanol extracts of ashitaba significantly reduced levels of blood glucose, serum insulin, HOMA-R and triglycerides (TG) in male Wistar rats that consumed drinking water containing 15% fructose for 11 weeks to increase levels of serum insulin and TG. In addition, extracts enhanced the expression of genes for acyl-CoA oxidase 1 (ACOX1), medium-chain acyl-CoA dehydrogenase (AMCAD), ATP-binding membrane cassette transporter A1 (ABCA1) and apolipoprotein A1 (APOA1) . These effects were likely due to 4-HD and XA themselves, since they were the major components of ashitaba extracts used in these animal experiments. These findings were also supported by studies showing that purified 4-HD and XA exhibited anti-hyperglycemic effects in cultured cells [20,25]. Recent studies have shown that dietary polyphenols play roles in preventing obesity . These effects can be attributed to the ability of polyphenols to directly or indirectly interact with adipocytes and adipose tissues . Because differentiation of adipocytes from preadipocytes plays a large role in the development of obesity , the inhibition of adipocyte differentiation might serve as a key strategy to control obesity. Zhang et al. therefore examined the effects of 4-HD and XA on adipocyte differentiation in 3T3-L1 cells and showed using Oil Red O stain, that both 4-HD and XA (both 5 μM) suppressed intracellular lipid accumulation without cytotoxicity. Mechanistically, 4-HD or XA inhibited the diﬀerentiation of preadipocytes into adipocytes by down-regulating expression of the adipocyte-specific transcription factors C/EBPβ, C/EBPα and PPARγ that are involved in AMPK signaling pathway activation. These chalcones also promoted the phosphorylation of AMPK and downstream acetyl-CoA carboxylase during 3T3-L1 adipocyte differentiation that was accompanied by decreased glycerol-3-phosphate acyltransferase-1 and increased carnitine palmitoyltransferase-1 mRNA expression (Figure 4). Both chalcones also promoted phosphorylation of extracellular signal-regulated kinases and c-Jun amino-terminal kinases . Figure 4 Proposed mechanism that 4-HD and XA inhibit adipocyte differentiation by MAPK and AMPK pathways . Zhang et al. then investigated the underlying mechanisms of the effects of ashitaba extract on adipose tissue and hepatic lipid metabolism in mice fed with a high-fat (HF) diet . In C57BL/6 mice given a normal or an HF diet supplemented with 0.01% or 0.1% (w/w) ashitaba extract for 16 weeks, ashitaba extract suppressed both body weight gain and fat deposition in white adipose tissue, while also reducing plasma cholesterol, glucose and insulin values, increasing adiponectin and decreasing triglyceride and liver cholesterol contents. Moreover, ashitaba extract increased AMPK phosphorylation in adipose tissue and liver and inhibited lipogenesis in adipose tissues by down-regulating PPARγ, CCAAT/enhancer-binding protein α and SREBP1 expression. They concluded from their results that ashitaba extract inhibited liver lipogenesis by down-regulating the expression of SREBP1 and its target enzyme fatty acid synthase, while promoting fatty acid oxidation by up-regulating the expression of carnitine palmitoyltransferase-1A and PPARα. Ultimately, these results demonstrated that ashitaba extract could prevent adiposity by modulating lipid metabolism through AMPK phosphorylation within adipose tissues and the liver, which was in almost total agreement with their findings of cultured 3T3-L1 cells in vitro as described above. Because excessive lipid accumulation in the liver might participate in the progression of obesity, diabetes and fatty liver diseases, Zhang et al. established an model of hepatic steatosis in vitro. They found that 4-HD and XA blocked lipid metabolism in HepG2 cells (an immortal cell line derived from liver tissues) stimulated with a mixture of palmitic acid and oleic acid . This inhibitory mechanism was at least partly dependent on decreased expression of sterol regulatory element-binding protein 1 (SREBP-1) and increased expression of PPAR through the activation of liver kinase B1 (LKB1)/AMPK, but independent of mitogen-activated protein kinase (MAPK) signaling pathways. Abnormal lipid metabolism is closely associated with obesity and dyslipidemia and all these factors serve as MetS diagnostic criteria. Ogawa et al. examined the effect of dietary ashitaba (0.2% ethyl acetate extract of yellow exudate) on lipid metabolism in spontaneously hypertensive stroke-prone rats (SHRSP) . Oral intake of ashitaba extract significantly elevated serum levels of cholesterol, phospholipid and serum apolipoproteins ApoAI and ApoE in SHRSP rats, with changes attributed to increases in high-density lipoprotein (HDL) containing ApoA1 and ApoE. Relative liver weights and triglyceride contents were also significantly decreased in SHRSP after intake of ashitaba extract, as were mRNA expression levels of enzymes involved in hepatic triglyceride metabolism, including hepatic acyl-coenzyme A synthetase mRNA. The also showed that dietary ashitaba might suppress both cholesterol transport and hepatic lipid accumulation. The 4-HD and XA chalcones and laserpitin (a coumarin compound) were subsequently identified as the active compounds responsible for these effects of ashitaba [18,19,35]. Visceral obesity is considered key to MetS onset, with MetS-associated thrombotic tendencies closely associated with visceral fat . Adipocytes associated with visceral obesity produce and release various physiologically active adipocytokines such as leptin, resistin, adiponectin and plasminogen activator inhibitor-1 (PAI-1), the primary physiological inhibitor of tissue type plasminogen activator (t-PA) [37,38]. High levels of plasma PAI-1 disrupt the ﬁbrinolytic system and induce a prothrombotic state that is associated with the development of pathological conditions such as thrombosis, ﬁbrosis and cardiovascular diseases . Thrombi become difficult to dissolve when plasma PAI-1 concentrations are elevated, with persistent blood clots leading to thrombotic diseases. Various tissues and cell types, such as liver, spleen, adipocytes, hepatocytes, platelets, megakaryocytes, macrophages, smooth muscle cells, placenta and endothelial cells, can synthesize PAI-1 . In fact, adipose tissues produce large amounts of PAI-1. Elevated plasma PAI-1 values are thought to originate from these tissues in obese persons  and are considered to comprise a major risk factor for thrombotic diseases in patients with MetS . Chronic low-grade inflammation has also been linked to progression of obesity and related diseases [43,44]. Because such inflammation occurs in adipose tissues of obese patients in close association with elevated plasma PAI-1 , controlling PAI-1 elevation associated with low-grade inflammation might ultimately prevent MetS-associated thrombotic diseases. The effects of ashitaba consumption on PAI-1 values have been examined in mouse models of low-grade inflammation and obesity to further explore the role of PAI-1 in MetS. Indeed, ashitaba exudate administered orally and intraperitoneally inhibited plasma PAI-1 elevation in mice with low-grade inflammation  and suppressed PAI-1 production in adipose, liver and heart tissues. Meanwhile, PAI-1 production by chalcones in cultured endothelial cells stimulated by the inflammatory cytokine TNF-α was also investigated. As described above, although XA and 4-HD comprise ≥90% of chalcones in ashitaba exudate, XA (but not 4-HD) suppressed inflammation-induced PAI-1 production by the human vascular endothelial cell line EA.hy926, implicating only XA in the inhibition of PAI-1 production . Ohta at al. investigated the effects of ashitaba yellow exudate on PAI-1 levels in vivo. Notably, feeding obese diabetic mice with ashitaba exudate suppressed plasma PAI-1 levels almost to the control levels found in lean mice . The exudate also decreased plasma parameters of glucose, insulin and TNF-α, as well as body weight gain in obese mice and gains in the weight of subcutaneous and mesenteric fat but had little or no effect on these parameters in lean mice . Ashitaba, consumed by humans since ancient times, is currently perceived as a versatile and healthy vegetable. The recent upsurge in health consciousness has helped ashitaba become a popular health food and dietary supplement. Along with its increasing popularity, more investigations have focused on this herb and several functions of ashitaba chalcones have been discovered. However, despite numerous convincing studies in vitro and increasing evidence that the biological activities of ashitaba chalcones could positively impact human health, ashitaba chalcones have not yet been developed as pharmaceuticals. Among the various known biological activities of ashitaba, its effects on MetS are most notable and have been demonstrated in mice both in vitro and in vivo. This review summarized the physiological effects of ashitaba on obesity and diabetes risk factors for MetS, including recent findings of its effects on blood glucose, obesity, lipid metabolism and MetS-associated thrombotic tendencies. Although the physiological effects of ashitaba on MetS appear beneficial, most findings were derived from experimentation using obese and diabetic mouse models, with only a few small clinical reports describing effects on healthy humans [48,49,50]. Therefore, larger cohort studies of humans with greater degrees of obesity, particularly visceral obesity, are needed. Moreover, additional investigations are needed to confirm possible medicinal applications from a clinical standpoint. In addition, because most attention has been directed towards the major chalcones XA and 4-HD, more exploration is needed to reveal the effects of trace ashitaba compounds on MetS. Finally, additional exploration of the mechanisms of the actions of ashitaba compounds on MetS is needed, since several studies have generated inconsistent results that might have involved differences in types of cultured cells or chalcone purity. Ultimately, more comprehensive analyses their activities are needed before ashitaba compounds can be applied to MetS treatment and prevention. Clinical testing is warranted to assess the anti-diabetic and anti-obesity properties of chalcones and additional preclinical data are needed before clinical trials of other biological activities can be implemented. Nevertheless, the accumulated body of evidence suggests that ashitaba has preventive and therapeutic potential for individuals who already have, or are at risk for developing MetS . Ashitaba compounds therefore hold great promise toward reducing morbidity and mortality due to cardiovascular diseases associated with MetS. Naoki Ohkura designed and wrote the first draft of the manuscript with support from all authors. All authors contributed to writing and reviewing the manuscript. Kalman DS, Hewlings S, Hackel V. A study to evaluate chalcurb® a standardized powder derived from the sap of the Angelica keiskei (Ashitaba) on markers of health in adults with metabolic syndrome. Adv Obes Weight Manag Control. 2018; 8: 203-208.